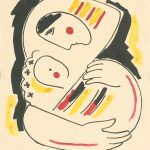 The first two decades of the 20th century in Slovakia offer us only a few occasions for more systematic research in the field of graphic work. Instead of continuous development we find only scrappy fragments of this field of fine art. Neither can we talk about schools or prevailing tendencies or about distinguished personalities who laid the foundations for the further development of this discipline. From this point of view national social themes are also more or less insignificant. 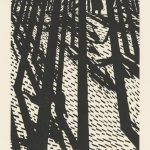 Therefore we can also notice very sporadic demonstrations of graphic work, mostly by artists whose work was intensely interconnected with the Hungarian environment. At the start of the 20th century there was no qualified art education in Slovakia. Between 1911 and 1932 the Gustáv Mallý Private Art School in Bratislava represented the only possibility in Slovakia for art education; the Euden Krón School of Painting in Košice was not founded until 1921 and the Academy of Fine Arts and Design (VŠVU) did not open until 1949. During this period the absence of a national cultural tradition began to be manifested in an urgent search for a Slovak identity in the art field. This phase persisted even beyond 1918. Hence in this period we cannot speak about a comprehensive history of modern art in Slovakia. Change came with the emergence of the Košice modern style, especially in painting. 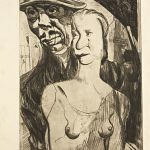 Starting in 1919, and under the influence of political events, Košice became a focus for the concentration of several European artistic figures, notably from Hungary (L Tihányi, G Schiller, B Kontuly and O Berger) but also including Czech artist F Foltýn. It is only natural that their stay in Košice not only influenced the town’s intellectual development but also had a positive effect on the development of fine art in Slovakia as a whole, thanks to its connection with modern European artistic initiatives. The establishment of the Eugen Krón School was certainly an important stimulus for the development of Slovak fine arts. From 1921 to 1926 several future artists studied at this school, including the graphic artist Koloman Sokol. As a whole this was a period of searching not only for new expressive elements but also for an identity. As it has been shown, relatively realistic works with a moderately expressive character but a more striking inclination to either national folk themes or socially-oriented forms (those two not being mutually exclusive) inspired the further development of graphic art in Slovakia. In this way the works of Gejza Angyal, Viktor Hermély and Anton Djuračka were grounded in their specific environment, being focused on the motifs of the Slovak village and portraying especially herdsmen and peasants. 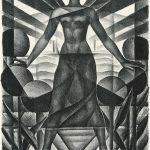 Other authors also devoted sporadic attention to graphic production after 1918, but it was Koloman Sokol who had the most significant effect on the development of Slovak graphic art. 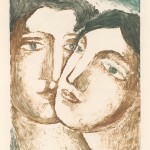 Even as a student during his early days at the Academy of Fine Arts in Prague, Sokol ranked among the leading representatives of European expressive, socially-orientated graphic production. During this period he became a member of the prestigious Hollar Association, through which he exhibited in the most important international centres of art and contributed significantly to the understanding of art in Slovakia. The importance of Koloman Sokol in connection with the development of Slovak graphic art was unique. He quickly broke free from provincial influences and, as the first of the Slovak graphic artists, considerably transcended Slovak territory. Subsequently he even influenced the creative art scene in Mexico where he taught and worked at the invitation of the Mexican government. In addition to the impact of Sokol and his work, the establishment in 1928 of the School of Arts and Crafts in Bratislava by its first director, distinguished Czech ethnographer and pedagogue Jozef Vydra, was also of decisive importance in helping the Slovak fine arts sector to break free from provinciality. Its immediate connection to all spheres of life, its searching for a synthesis of art and life and its connection to the art and craft expression of the avant garde Dessaus Bauhaus also proved to be extraordinarily positive. Of further importance were the Private Letters published from 1930 to 1932 by M Galanda and Ľ Fulla, in which they discussed new progressive opinions in fine art and their function in modern society. By their character these Letters became a unique manifesto proclaiming stylishness in art. Both artists also strictly applied these principles in their own work. In Fulla’s letters from this period we learn that he created not what he saw but rather the things that he knew. He also made full use not only of his knowledge of Cubism but also of styles of children’s fine art expression he had encountered in the Children’s Fine Art courses at the School of Arts and Crafts. In Galanda’s works we may also find village motifs. However, his works were substantial in the sense that they were deprived of their romantic sentimental character, originally planned shallowness and non-creative descriptiveness. The production of Ľudovít Fulla and Mikuláš Galanda during the 1920s and 1930s, in addition to the legacy of Sokol, had a marked effect on the further direction of modern Slovak graphic art, moving it beyond the pathetisation or decorative stylisation which had existed up to that time. Their rational core had importance in relation to the further examination of internal structures of graphic works, something attempted by several of their direct or indirect followers with varying degrees of success. The tendencies to search for, idealise and even heroicise the myth of the Slovak nation during this period were more striking. The production of Martin Benka represented an attempt to overcome the creation of this myth through sentimental, romanticising and post-romantic motifs. His works also represented a contrast to the usage of new formal artistic means. Even though the tendencies were less distinctive in the graphic arts, he also portrayed here a heroic over-dimensioned man in typical Slovak folk costume situated in Slovak mountain surroundings. Several graphic artists also joined the Surrealist and Avant-garde 38 groups, both founded in 1938, and their activities gave encouragement to those inclining to surrealistic production. From 1940 to 1942 the Collections of the Slovak Overrealists were published, with the co-operation of several graphic artists including Vincent Hložník, Ladislav Guderna, Viliam Chmel and Ervín Semian. During the early 1930s several university students, who were named according to their years of birth as Generation 1909 and Generation 1919, began their studies in Prague. During that period and shortly afterwards they formulated their own artistic programmes, which were deduced especially through direct or mediated lessons from the Paris avant garde. As in painting, they naturally found inspiration in the graphic works of earlier authors. Among the outstanding artists of Generation 1909, only Eugen Neva and Július Szabó, and partially also Cyprián Majerník and Dezider Milly, devoted systematic attention to graphic production. However the next generation, born in around the year 1919, formulated its programme with a greater concentration on the graphic arts. At the same time it can be said that while the authors of this generation – Orest Dubay, Vincent Hložník, Viliam Chmel, Ervín Semian and Ernest Zmeták – each based their works on different artistic foundations, all of them apart from Orest Dubay represented the same characteristics in their search for the connection of reality and over-reality. In the early works of Vincent Hložník, the most distinguished graphic artist of this period, there appears not only the striking antithesis of pathetisation and idealisation, but also a different understanding of the socially-oriented works which markedly affected the fine art in many European countries during this period. Although Hložník´s works were doubtless also a response to the traumas of this period, they may be perceived primarily as pictures of human tragedy in a historical context, depicting the apocalyptic scenes resulting from human acts through the generations. Towards the end of the 1940s, Ernest Zmeták began to devote more time to graphic production, especially themes of the Old Testament and folk motifs where he managed to gain maximum dramatic expression from the possibilities of wood engraving. In 1948 the Association of Artists and Friends of Graphic Art was founded in Slovakia. Its members included Matilda Čechová, Jarmila Čihánková, Orest Dubay, Vincet Hložník, Anton Hollý, Alojz Klimo, Eugen Nevan, Václav Sivko, Jozef Šturdík, Ernest Zmeták, Ľudovít Fulla, Dezider Milly, Eugen Lehotský, Július Szabó and Ľudovít Kudlák, and the first exhibition took place in May 1948 in the East Slovakia Museum in Košice. During the 1950s Slovak fine art, like other forms of art, was at a standstill. With the sole exception of folk production, most work was focused thematically on the Second Word War and especially on the Slovak National Uprising, with exhibitions only being held to commemorate different political anniversaries.